Rinse it before cooking. 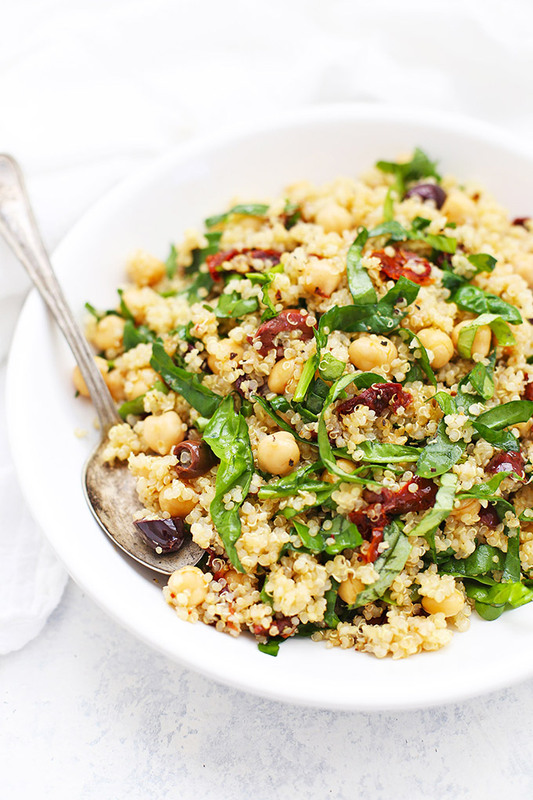 Quinoa is covered in a coating called saponin, which has a strong smell and bitter/soapy taste. Rinsing until it’s no longer foamy clears up that saponin, leaving you with a much more neutral, nutty taste. Water to quinoa ratio. 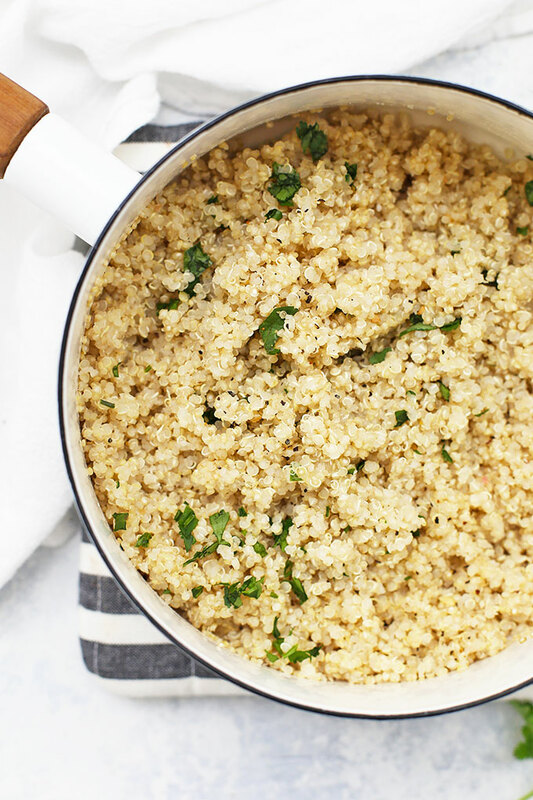 I use a 2:1 water-to-quinoa ratio, so I use 2 cups of water for every 1 cup of dry quinoa. Some prefer to use slightly less than 2 cups of water, but I get my most consistent results with the 2:1 ratio. Set a timer. If you over-cook your quinoa it can get a little mushy. I eyeball and estimate a lot of things in the kitchen, but I usually set a timer for quinoa. It has some flexibility, but for the *best* results, I recommend a timer. Leave the lid off when you boil. 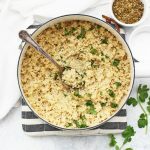 Boiling with the lid off helps you get a good amount of evaporation, which means your quinoa will cook through and the liquid will evaporate/absorb at just about the same time. I’ve found if I cover it the whole time, that’s when I’m more likely to over cook it or run into texture issues. 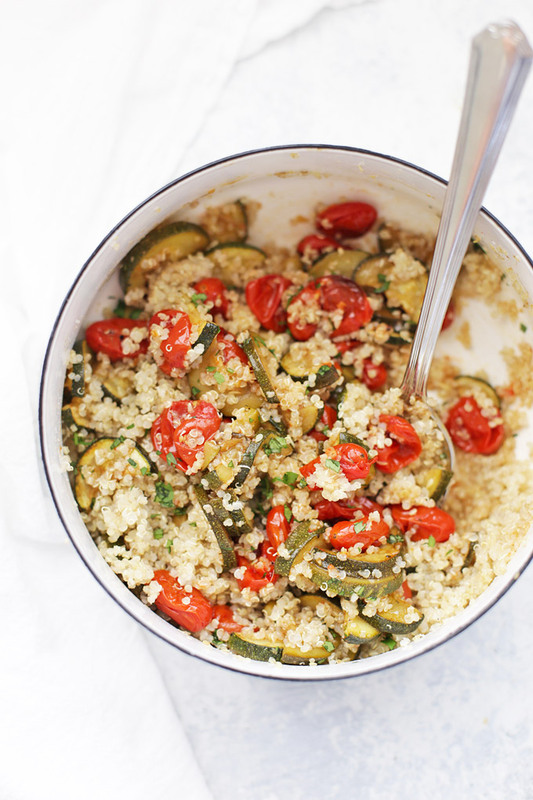 Pair cooked quinoa with roasted veggies – This Simply Roasted Zucchini & Tomatoes combo is awesome! The first suggestion is don’t skip the rinsing step! Next, is to cook quinoa using broth (chicken, veggie, etc.) instead of water, or using 1/2 broth and 1/2 water. Garlic + Butter/olive oil – Adding a clove of garlic and about 1 Tbsp of olive oil or butter makes it taste amazing. You can even play with flavored olive oils for a bigger flavor boost! Stir in some fresh herbs! I love using fresh herbs and this is an easy way to use whatever you have on hand. My personal favorites are cilantro or basil. They brighten up the whole dish! Parsley and dill can also be nice, depending on what you want to serve them with. Add a squeeze of lemon or lime juice. Fresh citrus adds some really nice brightness. I love adding a bit of olive oil and a squeeze of lemon or lime juice. So good! Stir in some salsa or pico de gallo. 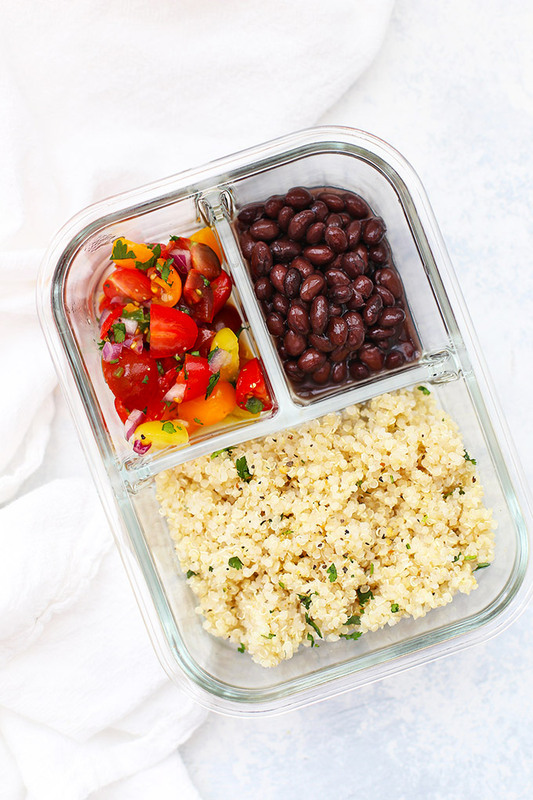 This works especially well if you’re using it as a side dish or as a base for burrito bowls or meal prep. 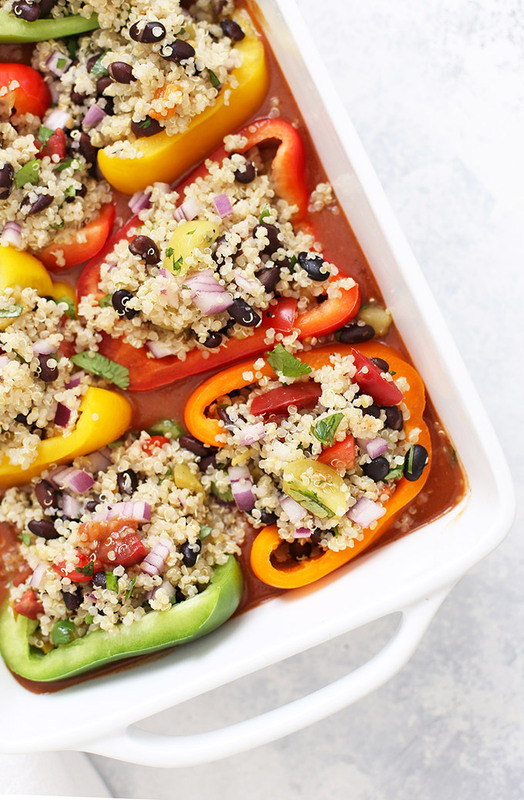 But a scoop of salsa + quinoa = easy and delicious! Thank you! Finally, I know how to pronounce quinoa! I’ll be anxiously awaiting the salad recipe (Sophie-permitting). 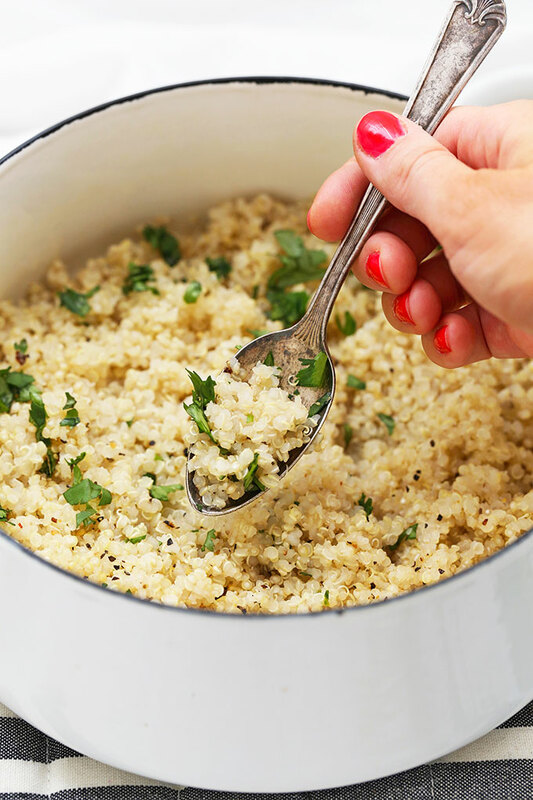 I love quinoa, and sometimes I feel like I’m trying to convince the world to try it out because I’m sure once people do they will love it. This is a great, simple way to prepare it. Thanks for sharing! Hmmm… you didn’t mention anything about washing/rinsing the quinoa. Did you buy prewashed? I WANT to like the stuff but the few times I’ve tried it it tastsed like dirt or soap or a combo of the two. I’m pretty sure I need to wash it better but haven’t found a good way to do it. My strainer has too big of holes and I loose too much when I try to use cheesecloth (it sticks to it). Any thoughts? Melissa–Yikes, I’m sorry! I’ve only been able to find it in boxes and it’s pre-washed. I do find the “grainy” taste is a bit stronger than say, rice or oats, but I haven’t had any bad experiences. 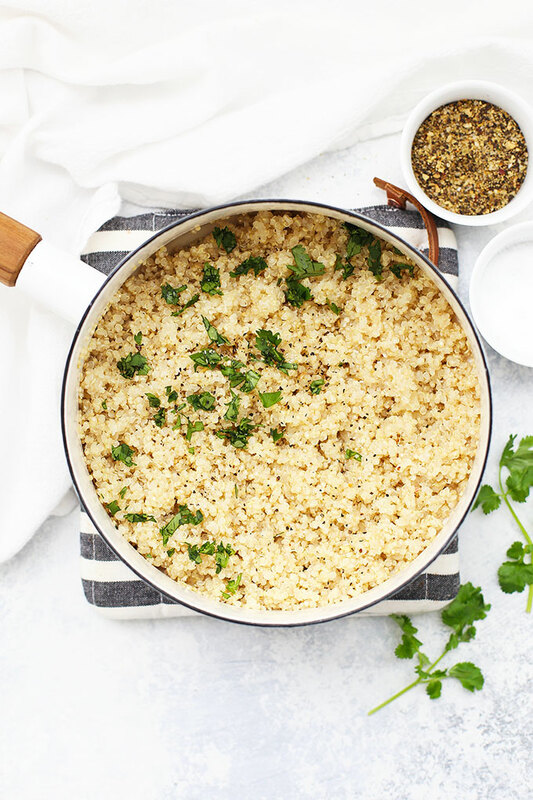 I’ve heard cooking it with broth instead of water helps kind of “soften” the quinoa taste. I don’t mind it as is. I would definitely just rinse with water, not soap, however. Another idea would be to serve it with something that will help the grain taste, such as a vinaigrette or sauce. Hope that helps! I have seen this product but not tasted it yet. 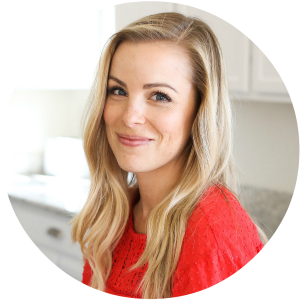 I’m totally going to… Thank you for expanding my horizons! Thank you for the recipe, Emily! I’ve wanted to try quinoa for a while now, but I’m a bit scared – I’ve heard horror stories about it. 😉 You make me want to try it out! Where do you buy quinoa? In a health food store or where in the grocery store? By the rice? Your recipe looks great! I am dying to try it! Laura – I’ve found it by grains and beans. Some of the stores I shop at keep it by rice, barley, etc. Others keep it near the beans. Best of luck! I can find it at either health stores (where I listed) or my local Kroger store (in the health food section). I bought some quinoa tonight to try. While looking at the nutrition label, I found that what I bought had more carbohydrates than white rice. I am new to this I am trying to cut way back on things like white rice, pasta, white bread, etc. I know there is some I just do not know. Can you tell me what makes this better for me than, say, brown rice? I particularly agree with on finding different ways of making quinoa more enjoyable. I like to add soy or tamari sauce to my quinoa with some cucumbers. I know that sounds weird but it works for me.